Overwhelmed by America’s problems sometimes? Dr. Kathryn Edin, a prominent sociologist from Johns Hopkins University, has spent decades researching the family formation and dissolution behaviors of low-income men and women in this country, and she’s published three publicly-accessible books and numerous scholarly publications that shed a lot of light on why they tend to choose to have children but not marry, why the romantic relationships they form tend to be fragile, and how parenthood gains powerful meaning in their lives. A delightful, down-to-earth individual, a devoted wife and mother, and a caring citizen involved in not only researching her subjects but trying to improve their lives with community service, she can help members of both the campus and wider communities understand those problems better, and be encouraged by the solutions she suggests. Dr. Edin will explain what her research has revealed regarding family instability and complexity, and the kinds of public policies that have been most effective in helping those families. All are invited. Kathryn Edin is the Bloomberg Distinguished Professor in the Department of Sociology at Johns Hopkins University. Her extended ethnographic research among low-income U.S. populations has helped to shed light on why they tend to choose to have children but not marry, why the romantic relationships they form tend to be fragile, and how parenthood gains powerful meaning in their lives. She has published a number of general interest books and academic studies on these subjects. She received her PhD in sociology from Northwestern University, her MA in Sociology from Northwestern University, and her BA in Sociology from North Park University. She has taught at Harvard University as a Professor of Public Policy and Management and served as chair of their Multidisciplinary Program in Inequality and Social Policy. She is a Trustee of the Russell Sage Foundation and on the Department of Health and Human Services advisory committee for the poverty research centers at Michigan, Wisconsin, and Stanford. 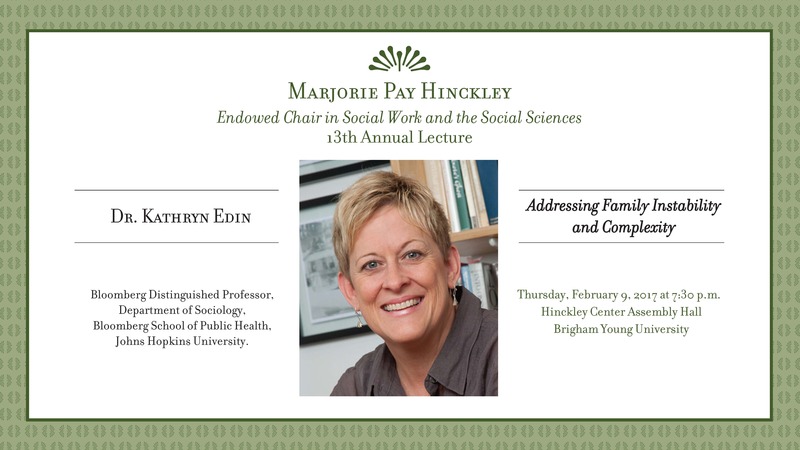 This much-anticipated event is the Hinckley Lecture, offered by the Marjorie Pay Hinckley Endowed Chair in Social Work and the Social Sciences. The Chair is dedicated to strengthening home and family and offers research, mentoring, and conferences towards that purpose. This will be the thirteenth year that a prominent social science scholar has delivered a lecture aimed at alleviating the various stresses that families face. Past lecture topics have included positive youth development, forgiveness in marriage, the effects of playing violent video games, and teenager’s spirituality.